The part of the country famous for its "Tornado Alley" may be in jeopardy of losing that distinction. 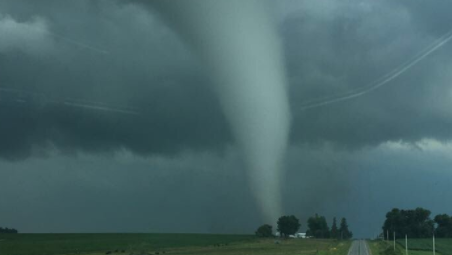 A new study says the tornado threat zone may be spreading eastward, to the densely populated southeastern U.S., and that could lead to a "threefold increase" in disaster potential. One of the study's authors says climate change could be behind the shift, as drier air creeps into the Southeast. Such a shift would be good news the southern and western Plains states, but a threat to others. More tornadoes in a more vulnerable area is a recipe for disaster. The study, conducted by two severe-weather researchers, Harold Brooks of NOAA's National Severe Storms Laboratory in Oklahoma and Dr. Victor Gensini of Northern Illinois University, noted "significant increasing trends (of tornadoes) in portions of Mississippi, Alabama, Arkansas, Missouri and Illinois." The increased risk of disaster is due to a combination of factors, but greater vulnerability is apparently the biggest. In part, that vulnerability stems from the mid-South being more densely populated, meaning more people are exposed. In addition, there are more trees in the region and that, combined with wetter, "rain-wrapped" storms make the tornadoes harder to see. Tornadoes also happen more often at night in these areas. But potentially the most dangerous factor for the Southeast is the large number of weak-framed homes there. According to Gensini, half of tornado fatalities occur in weak-framed homes. Researchers say the shift eastward is being caused by the creeping of drier, desert air farther eastward in the Plains states. In Tornado Alley, the boundary between dry, desert air and warm, moist Gulf of Mexico air is famously called the Dry Line. That's where much of the severe weather originates. But a recent study by Columbia University substantiates the movement of the so called "100th meridian" (100 degrees longitude) eastward over the past 100 years. Since severe weather forms in moist air, the eastward shift in tornadoes makes sense. Gensini told CBS News "it's not a big jump to say that climate change is causing this shift east. The hypothesis and computer simulations support what we are observing and what we expect in the future." Climate change is projected to make the desert Southwest even drier. And this drier air will continue to move farther into Tornado Alley. At the same time, climate models predict more moisture and severe weather in the Gulf States. Gensini said that although "as a scientist, you never want to say never," there is "no supporting evidence" that the cause for the shift is natural. Storm chasers are noticing the shift, as well. "Following it for the last 12 years, we have noticed more chasers having to chase further into rugged terrain east of the normal Tornado Alley," said Kory Hartman, owner of Severe Studios Storm Chasers. "It seems to stay colder and drier in the spring, so you don't see as many early season outbreaks in Kansas, Oklahoma and Texas." To address the question of whether "this eastward shift is just a result of more people observing tornadoes," Brooks and Gensini examined the frequency of U.S. tornadoes and found it has remained relatively constant since the beginning of reliable record-keeping 40 years ago. That diminishes a possible link to reporting or data-recording errors. Although the study focuses on the increasing threat of tornado outbreaks east of the Mississippi, the study notes the southern Plains states still remain the Tornado Alley bulls-eye.